Download a free printable feelings chart for your children. 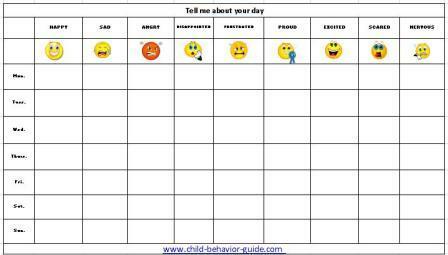 Kids that have difficulty expressing how they are feeling or letting their parents know about things that have happened during the day can use mood charts to help. 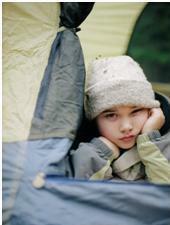 An emotion chart helps eliminate a child behavior problem and encourages better communication about any anger they may be hiding that eventually leads to a huge blow up. They are also great for dealing with disrespectful children because they allow the child to appropriately tell you what their feelings are that day. By sitting down together and using this simple yet fun way of communicating with each other, you will build an even greater bond that lets him/her know you are listening, that you care and potentially even prevents aggressive behavior in children. The first chart is great for younger children or children with attention difficulties, such as ADHD symptoms or asperger syndrome behavior. The child can simply circle the feelings they are having that day and then elaborate in the last column any significant events that happened that day. The five W’s help to encourage your child to provide more details. Either you can write in the column what your child says or allow your child to write in the column on his/her own. The second chart is good for older children to help them tell you about their day and the feelings associated with each event. Have your child go through the different feelings each day and write a few words about any events that may have happened that caused those feelings. For example, maybe your child got an A on a test, then he/she would write “A on test” under the feelings “Proud” and "Happy." Note: You must download Adobe Reader below and temporarily disable pop up blockers to view the behavior charts. It may also take time to download, so be patient it's worth the wait. You will need Adobe Reader (the latest version is recommended) installed on your computer in order to open and print one of the charts. You can get Adobe Reader here (a new window will open so you can download it without leaving this page, but you will need to temporarily disable any pop up blockers to open the new window and the charts). If you want to open the file in your browser window, just click on the chart. However, if you want to download the file to view later, then right-click on the link and choose "Save Target As" or "Save File As." Then select where you want to save the file on your hard drive.